I love sous vide cooking. Those of you who have discovered it know what I’m talking about – nothing short of a new frontier of culinary technique, and one of the first pure intersections of science and cuisine. However, if you aren’t willing to drop $1000+ (or you don’t have a soldering iron and some patience) it used to be the case that you were excluded from the inner circle of sous vide wizardry. 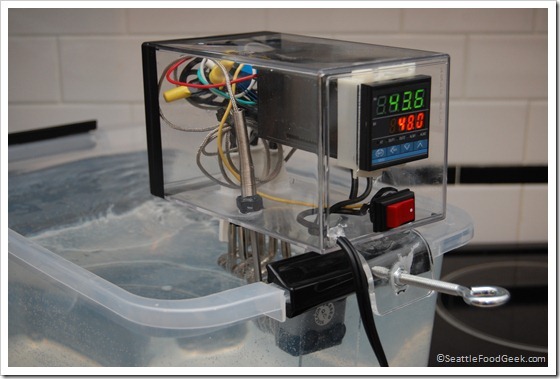 Professional thermal immersion circulators are extremely expensive and, due to their scientific design aesthetic, aren’t very likely to show up on the shelves of Sur La Table anytime soon. But, for the first time, a home cook willing to spend $450 (the price of a top-of-the-line stand mixer + accessories, for example) can experience for themselves the eye-opening, mouth-watering, religious revelation of their first sous vide steak. I’ve blathered on for the last handful of posts about how great sous vide is, and to a certain extent, I’ve become obsessed with the method. So, you can imagine my delight when the nice people at SousVide Supreme offered to let me test drive a unit for two weeks (there’s my disclosure). When the unit arrived, I anxiously brought the box inside and began unpacking. The first thing that struck me? “Damn, this thing is big!” So big, in fact, that there was no hope of ever storing a unit like this anywhere in my kitchen. For the entire two week trial run, it sat on top of my stove, next to my stockpot that’s also too big to find a home. If you can’t tell from the picture above, the unit is about the size of a large bread machine. And although it’s handsome enough for what it does, I’m not sure I would acquiesce to the idea of making this behemoth stainless brick an objec d’art atop my precious counter space. That said, I’ve found myself cooking nearly everything sous vide recently, so perhaps it wouldn’t be such an inconvenience to have the machine on display all the time. Once I got over the size issue (like a blind date with a girl who has “a great personality”), it was time to put this unit through its paces. 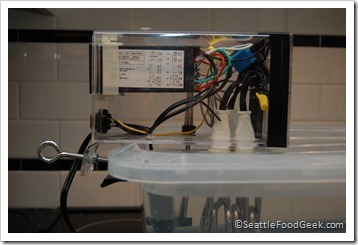 By now, I had already been cooking with my DIY sous vide machine for a few weeks, so I had some reasonable expectations of heating time, temperature evenness (temperature measured at different spots in the basin) and temperature fluctuation (how well the target temperature holds over time). I filled the unit’s basin with hot water from my kitchen faucet to speed up the pre-heating time. If you haven’t been to the gym in a while, you might notice that the water-filled unit is quite heavy. The unit features well-placed inset handles to help with carrying, but even so, it’s a precarious beast when full – especially when full of hot water! It would be great to see a drain valve in version 2, since it’s very difficult to negotiate 30 lbs of 120° water up and into the kitchen sink without spilling everywhere. The SousVide Supreme comes with a wire food rack (shown in the picture above) which actually does a great job of keeping your food in place and allowing ample circulation. Unfortunately, since the unit doesn’t have circulator of any kind, you’ve gotta rely on convection currents to distribute heat evenly through the basin. I was initially quite concerned that this would result in hot and cold spots (which it does) but the temperature differences were reasonably small – within .5°F as measured with a laser thermometer. Heating from faucet temperature (about 110°F) to cooking temperature (about 144°F) took about half an hour – a time scale consistent with my DIY machine, and certainly reasonable for anyone who’s ever waited for an oven to preheat. However, I was quite surprised to see the temperature fluctuations of the machine over time. The video below shows 1 hour of cooking time condensed into 2.5 minutes. The target temperature remained fixed at 144°F, and there were no external factors influencing the temperature (eg. I never removed the lid, opened a window, turned on the stove – in fact, I wasn’t even home!). The temperature varies between 142.1°F and 144.5°F, and if you watch closely, you’ll notice that this variation happens in a very cyclical manner. In other words, the machine is programmed to allow a zone of acceptable temperature that is at least 2.4°F wide. These temperature fluctuations weren’t noticeable on beef short ribs or potatoes, where there is a wider zone of doneness. However, if you’re finicky about your steak, and especially if you’re aiming for the Goldilocks zone on eggs, those temperature swings may make a difference. As you can see in this invaluable guide to sous vide cooking there’s a substantive difference between eggs cooked at 146°F and 148°F. All in all, however, the SousVide Supreme did a fine job cooking. Plus, I felt completely comfortable leaving the unit unattended to run overnight or while I was away at work. The all-in-one design certainly is convenient, but the machine’s bulk means you’ll have to annex the dining room to find storage. I’m delighted to see the SousVide Supreme bring sous vide cooking into home kitchens for the first time, and very excited at what the future may bring! Sous vide cooking works its magic on a lot of foods, but short ribs yield some of the most dramatic results I’ve seen. In traditional recipes, the ribs (usually cut into short 2-3” chunks by the butcher) are braised for several hours. Although the braising method adds great flavor and makes the meat extremely tender, the meat is also necessarily well-done. But, thanks to our sous vide wizardry, we’re able to maintain a perfectly-pink medium rare and have our meat come out fork-tender. Feel free to experiment with marinades in the bag, but know that some herbs, like thyme, will start to reek after 3 days in the bath. Special equipment: sous vide heating immersion circulator, vacuum sealer and (optional) blowtorch. 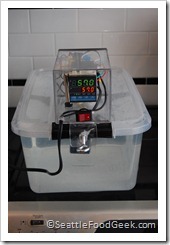 Preheat a large water bath to 56C (133F). 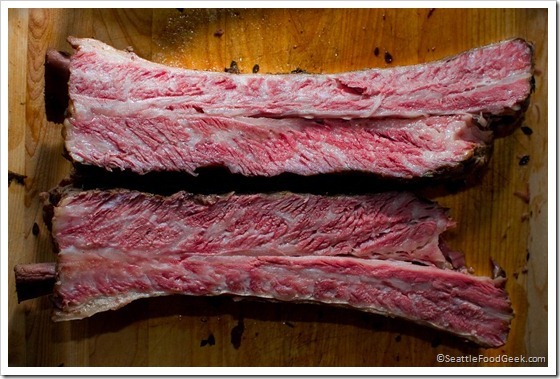 If using an uncut slab of short ribs, trim off any large areas of fat on both sides. Coat all sides of the meat with salt and garlic cloves. Place slab (or pre-cut short ribs) into a large vacuum seal bag. If using pre-cut pieces, you may need to divide them between 2 bags, ensuring there is plenty of space between the ribs. Seal the bag. Fully submerge your bags in the water bath and cook, turning the bags every 12-18 hours. After 60 hours, increase the heat to 62.5C (144.5F) and cook an additional 12 hours. If using a blow torch: Pace a cooling rack on top of a sheet pan or jelly roll. When ready to serve, remove the ribs from the bag and drain. If using a slab of ribs, turn the ribs bone-side-up and slice through the meat between the bones lengthwise to separate out each bone. Cut the membrane running the length of the bone and slide the bone loose (it should give easily, with a little encouragement from your knife). Trim any access fat surrounding where the bone used to be. Cut the trimmed meat into portions. If using the blowtorch, place a cooling rack above a sheet pan or jelly roll pan. Place each portion of ribs on the cooling rack, allowing plenty of space in between. Pat the ribs dry with paper towels. Using your torch, sear all sides for a few seconds, or until golden brown. If you’re not using a blowtorch, give the ribs a quick fire under the broiler or in a little oil on a smoking-hot skillet to brown all sides as quickly as possible. After tasting these short ribs, I may never cook any type of ribs the same way again. This summer, I plan to lightly smoke a rack of spare ribs, then cook them sous vide for a few days before finishing them back on the grill. I expect pretty incredible results. 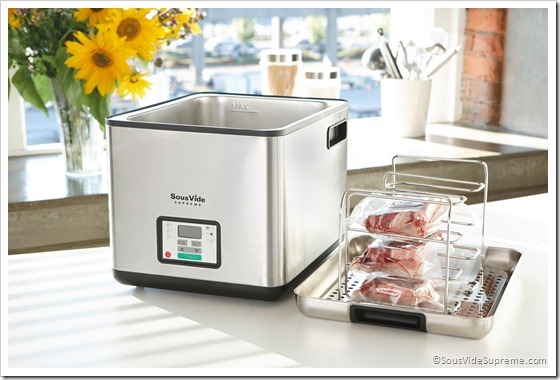 I’ve recently been fascinated by the idea of sous vide cooking – a method of slowly cooking vacu-sealed foods in a precisely controlled water bath to achieve the optimal doneness. Last year, Sur La Table started carrying the world’s first “home” sous vide cooker, the SousVide Supreme. This was fantastic, since commercial sous vide cooking machines cost north of $2000. However, the home model (priced at $450) is still a steep investment for something that essentially just keeps water warm. I was determined that I could build a better device on-the-cheap. 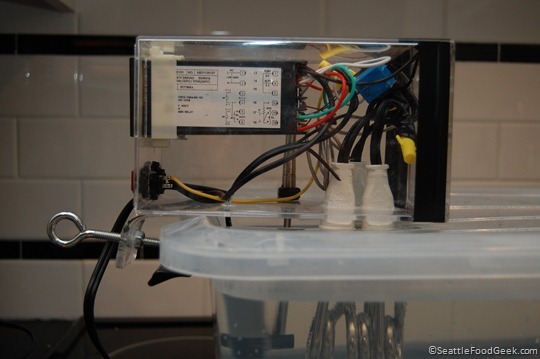 Behold, the $75 DIY sous vide heating immersion circulator! 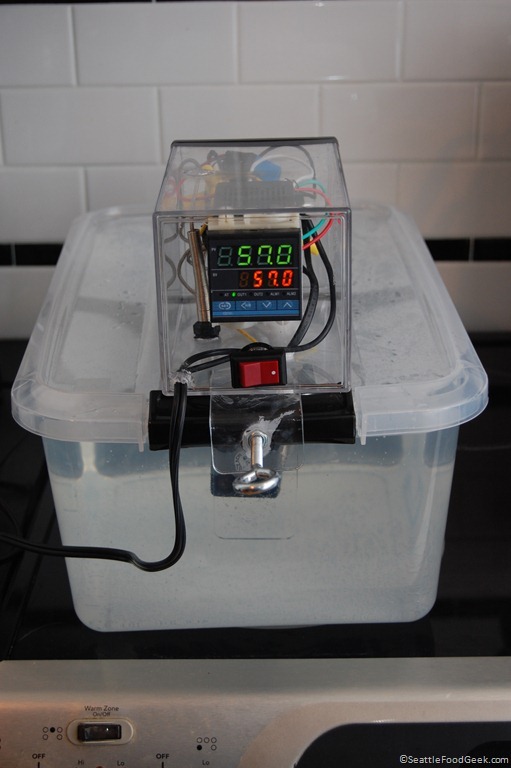 By scrapping together parts that are readily available on eBay and Amazon, I was able to build a self-contained device that heats and circulates water while maintaining a temperature accurate to .1 degree Celsius (yes, point one degrees!). And unlike the SousVide Supreme, my device can be mounted onto any container (up to a reasonable size, perhaps 15 gallons) allowing you more room to cook, if needed. To build your own device, you’ll need some basic soldering skills, the list of stuff below, about 6 hours of free time (plus time for glue to dry) and the can-do attitude of a geek who doesn’t want to pay $450 for a water heater. Click the “more” link for complete step-by-step instructions. If these instructions have helped you build you own machine, I hope you’ll consider donating. My goal is to mass-produce the world’s first sous vide heating immersion circulator for under $100, and every donation helps! Update: Along with my business partners, I’ve finally commercialized a home sous vide machine! It’s called the Sansaire, and it’s available for pre-order now!